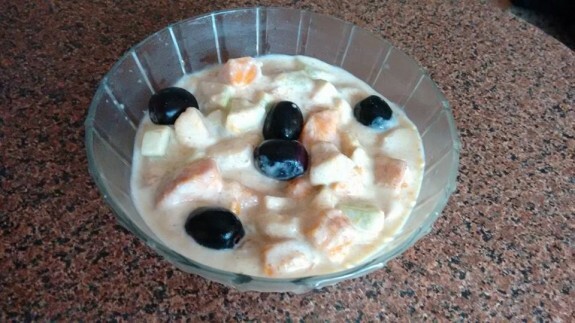 Fruits raita is a healthy and tasty preparation of various fruits mixing with yogurt or curd. You can use any diced fruits like mango, banana, pineapple, black grapes, green grapes, pomegranate, cucumber, strawberry, apple, black plum and many more. Mixed fruits raita has full of healthy nutrients which is generally favourite among kids. They can enjoy this recipe and have multiple fruits in a single preparation without any hesitation. Here, I did not use lots of fruits as I don’t like citrus and sweet fruits at a time. So, I use mango, banana, apple, cucumber and black plum at a time. 1. Take yogurt in a big bowl and whisk it till the yogurt becomes smooth. 2. Now, add cumin power, sugar, salt and black pepper powder and mix everything well. 3. Add chopped fruits and fold all the fruits with yogurt mixture. 4. Serve the fruits raita immediately.